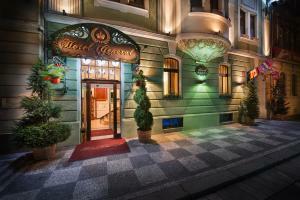 Hotel Brilliant Distance to the centre of town 5.8 km price per day from €27 Located in a quiet residential district of Prague, Hotel Brilliant is just a 6-minute walk from the Prosek underground station. The functionally furnished rooms have a bathroom and satellite TV. Guests can benefit from a 24-hour front desk and play billiard. Hotel Brilliant serves a daily breakfast buffet and features a shared kitchen. An all-year bobsleigh run is only 50 metres from the Brilliant. DC Rezidence Distance to the centre of town 6.6 km price per day from €36 Situated in a residential area of Prague a 20-minute drive from the heart of the city, DC Rezidence offers an en-suite rooms, 2 restaurants located in the same complex, a private parking lot, free WiFi, as well as spa and fitness facilities. The colourfully styled rooms at Rezidence DC come with a private bathroom including toiletries and a flat-screen TV. Breakfast can be arranged upon a prior request and for a surcharge. Hotel Tiepolo Distance to the centre of town 3.1 km price per day from €19 The Hotel Tiepolo is located 300 metres from the Andel shopping centre and metro station. Prague's Old Town is only 1 metro stop or a 20-minute walk away. Rooms offer twin or double beds and a seating area. A private kitchenette is available upon a request and for a surcharge. The tram from the nearby stop (50 metres) takes you directly to the centre and a shopping mall is reachable within a 5-minute walk. 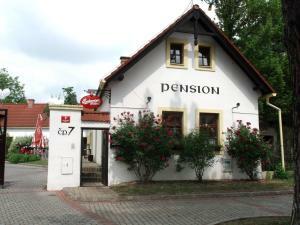 Český Statek Distance to the centre of town 10.2 km price per day from €25 Surrounded by a lush garden with a lagoon, Cesky Statek is a small family run pension. 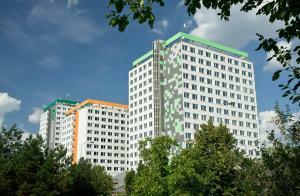 It is located in Prague’s residential 9th district. They include such amenities as flat-screen TVs, a free wired internet and a minibar. Classic Czech dishes dominate the restaurant’s menu. Traditional dining room includes a fireplace and offers a large terrace set amidst the fragrant garden. 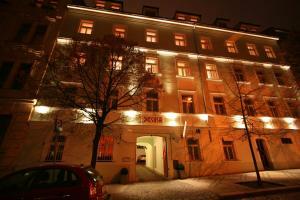 The centre of Prague can easily be reached from the nearby Dolni Pocernice Train Station which is 500 metres away. Hotel Avion Distance to the centre of town 6.3 km price per day from €35 This new and modernly styled hotel is located in the quiet district of Prague 6. 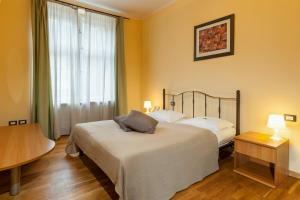 5 km away from the city centre and only a 30-minute walk from Prague castle. It takes you just a 300-metres walk to get to the next tram stop and a 500-metres walk to the closest metro stop. All of the nicely furnished en-suite rooms are provided with a hotspot for free wireless internet access. Start your day at the complimentary breakfast buffet and set out to explore the Golden City or for successfully doing business. Penzion U Staré cesty Distance to the centre of town 4.8 km price per day from €39 A 15-minute tram ride from Charles Bridge, Penzion U Staré cesty is located in a quiet residential area of Prague and offers you en-suite rooms with refrigerator, free parking, free WiFi and an à-la-carte restaurant. All rooms come with a private bathroom with hairdryer and a TV with satellite channels. The on-site restaurant features a garden terrace and you can enjoy typical Czech specialities, international cuisine and breakfast there. Residence Bene Distance to the centre of town 1.8 km price per day from €34 The Bene is situated in the historical heart of Prague, less than 100 meters from Republic Square and Old Town Square. All rooms feature modern interior design and hardwood floors. Room amenities include fridge, kettle, microwave and satellite TV. A buffet breakfast is served in the elegant dining lounge on the ground floor. Restaurants and bars can be found in most of the surrounding streets. The staff will be pleased to arrange transfers with the residence’s taxi service, tickets for cultural or sport events and sightseeing tours. 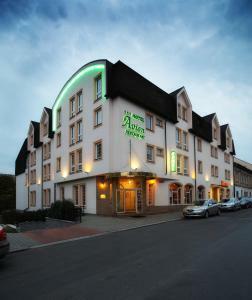 Hotel Pivovar Distance to the centre of town 5.8 km price per day from €26 In the building of an old Czech brewery guests can find Hotel Pivovar. The Old Town can be reached by metro within a 10-minute drive and Prague’s O2-Arena is just 500 metres away. The hotel’s rooms are quiet and come with free Wi-Fi. Hotel Pivovar has a garden and guests can dine at the restaurant or get packed lunches. The Vysočany Train Station and the Libeň Train Station both can be reached within a 10-minute walk. 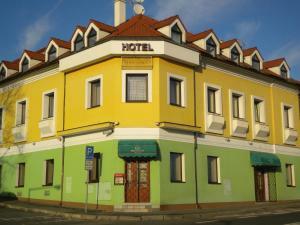 Hotel Max Distance to the centre of town 8.5 km price per day from €22 Hotel Max enjoys a quiet location in the Prague’s 9th District of Jahodnice, a 40-minute ride by public transport from Prague’s Old Town. The hotel offers functionally furnished rooms and free Wi-Fi. You can sample Czech beer and small dishes at the on-site bar and park your car free of charge in front of the building. The Letňany Metro Station (line C) can be reached in a 12-minute bus drive. A shopping centre is located at the Letňany Metro Station as well.